Meadow habitats have been in decline throughout Ontario due to the expansion of urban areas, the intensification of agriculture, and the suppression of natural disturbances such as fire. The loss of meadow habitat has led, in turn, to the loss of food sources, migratory staging areas, and overwintering or nesting areas for a number of bird and butterfly species, and is the reason why a number of native plant and animal species have been listed under the Endangered Species Act, 2007. A meadows is defined under Ontario’s Ecological Land Classification as a community dominated by grasses and herbs, with tree and shrub cover of 25% or less as a result of human disturbance. Meadow communities are maintained over time by patterns of natural or human disturbances such as cycles of fire, drought, soil scarification or mowing. In the Greater Toronto Area (GTA), meadows are often transitional communities, dominated by grasses, forbs and other non-woody plants. Meadows support plants that use surface water and/or shallow ground water. HOW IS TRCA RESTORING MEADOWS? Meadows are great for naturalizing areas where existing infrastructure may not allow for woody trees and shrubs. The site can be seeded with a native wildflower and grass mix chosen to match the moisture content of the soil. In some cases, berry- or nut-producing shrubs may be planted to increase the variety of habitat and food within the meadow. Additional habitat features such as downed woody debris, raptor poles, snake hibernacula and nest boxes can also be installed to increase habitat opportunities. 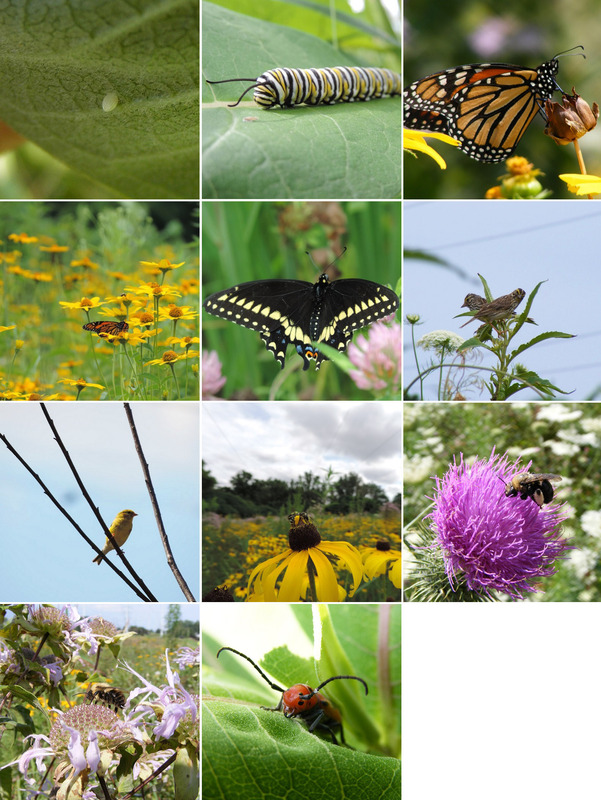 In the absence of natural disturbance, meadows will typically succeed into forest communities. To ensure native seed establishment and promote biodiversity, meadow restoration projects require a maintenance regime that is appropriate to the site and project objectives. 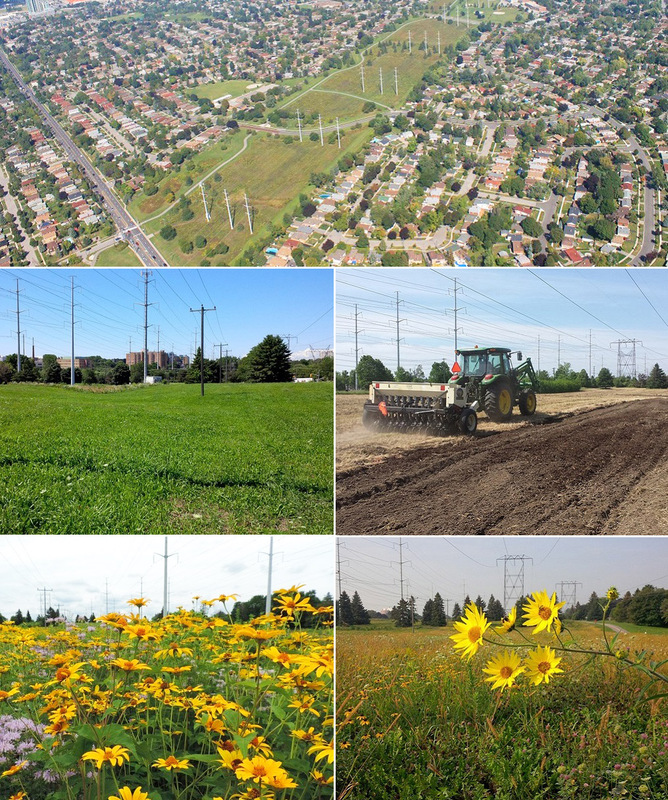 The Scarborough Centre Butterfly Trail is an example of meadow restoration within a hydro corridor in the Highland Creek watershed of Toronto. East to west multi-use trails connect communities across the hydro corridor and provide recreational opportunities for the local residents. Hydro corridors are typically mowed to maintain access to hydro lines and limit tree growth. Meadows are an excellent alternative to mowed grass, as they help to create a vibrant, biodiverse ecosystem and are compatible with the management requirements of the hydro corridor. Meadows complement other amenities in the corridor such as community gardens, trails, and sports fields. The Scarborough Centre Butterfly Trail. Top: Aerial view of meadow establishment. Middle left: Before: Mowed turf grass. Middle right: During: Seeding the meadow; Bottom left: After meadow establishment: Bergamot and Sweet Ox Eye in hydro corridor meadow. Bottom right: After meadow establishment: Tall Sunflower and Black Eyed Susan in hydro corridor meadow.